We allow the hiring of private travel in the large Surrey village Kingswood – whether that travel will be strictly within the settlement’s boundaries or treat it as just a start or end point. Wherever you seek to travel in a Kingswood cab, we operate a fleet you will love. Upon placing your booking, you can anticipate the vehicle arriving at the location that you specified during the booking process. At the wheel will be a friendly driver capable of taking account of what you want or need. That driver also would have been put through CRB checking for your comfort. The driver can listen to a wide array of your concerns. Would you like to be dropped off at a hospital or GP’s surgery? Driven to your next destination with our Kingswood airport transfers? Taken around to allow for sightseeing or shopping? The driver can deliver all of these services and many others. If you live in Kingswood but plan a holiday away from the village, the booked vehicle could initially reach you in this area before taking you to an airport. From there, you could obviously take a flight abroad. 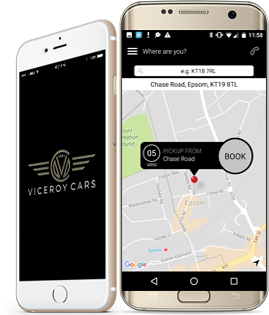 Alternatively, you may be interested in having some vital supplies delivered late at night to your Kingswood home; at Viceroy Minicabs, we offer minicabs Kingswood love. Another possibility is that of wanting your children to be transported to school or workers taken to the workplace more effectively. Either can indeed be made possible thanks to professional drivers in our employ - and can be especially easy for you to appreciate if you often find yourself incredibly short of time but want your children or workers to arrive on time day-by-day. There is a wide choice of intriguing places to visit in the Kingswood area. These include the battlemented gothic mansion Kingswood Warren, the early Victorian building of St. Andrew's Church, and Kingswood Golf and Country Club. Imagine the enjoyment of visiting all of these places with assistance from our reliable vehicles and drivers. Click here to make your booking online, use info@viceroycars.com for hiring via email, or dial the number 01372 722222 if you opt to book by phone instead. The things I love most about this taxi company is their app. It’s easy to use and so convenient for booking when you’re out and about. Viceroy Cars is my first choice whenever I fancy a shopping day in London. Their prices are so reasonable and their service is always brilliant. I use Viceroy Cars for the school run, otherwise I just couldn’t get to work on time. I know they are in safe hands and will get to school with plenty of time to spare.